Innotree Fairy lights - Create a magical and romantic life for you! Innotree's starry lights only use premium quality LED bulbs and golden lacquer coated copper wires. Our fairy lights are equipped with 3 plating copper wires, which are safer and more durable than those cheap lights with naked copper wire and tiny LED bulbs. The mini led lights are equipped with USB socket instead of traditional AC/DC socket so that you can use mobile power bank to operate the lighting, that means you can use it almost anywhere you like such as outdoor, camping, party, wedding, bedroom, patio, garden or cafe etc. Much more convenient than other plug in LED string lights. The copper wire is IP65 waterproof, no worry to use them in the water or rain. Perfect for indoor and outdoor decoration. Please kindly note that power adapter is not waterproof, it should be covered in rainy days. 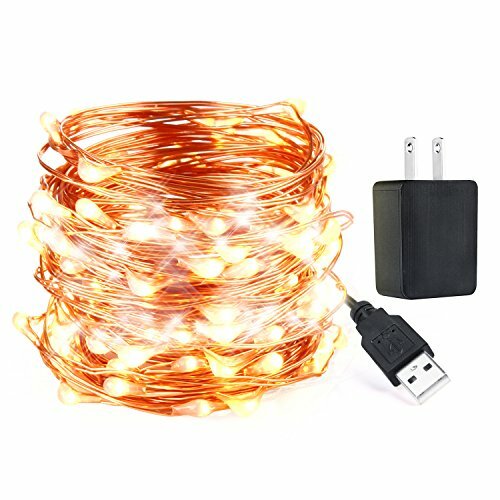 100 LED Brilliant String Lights - 100 super bright LED bulbs on 33ft golden lacquer coated copper wires. Our fairy light are equipped with 3 plating copper wires, which are safer and more durable, ideal for indoor and outdoor decoration, bedroom, patio, wedding, party etc. USB Plug in Design - Easy and convenient for you to use the fairly lights with mobile power bank anywhere you like such as outdoor, camping, party, cafe, wedding, home, bedroom, patio, garden etc. Cost Effective & Energy Efficient - LED string lights will not overheat and remain cool after prolonged usage. 2700-2900K warm white (aka yellow) LEDs fairy string lights will illuminate a dark corner and create a romantic atmosphere in your home, restaurant or shops. UL Approved Adapter - The included UL certificated USB AC/DC power adapter alternatively lets the string lights work with wall outlet. This mini USB power adapter can be used as power charger for your variety digital devices also. If you have any questions about this product by innotree, contact us by completing and submitting the form below. If you are looking for a specif part number, please include it with your message.